In January 2011, I wrote a piece about Boulevard du 30 Juin when the expansion to 8 lanes of the original four was nearing completion (Jan. 23, 2011). 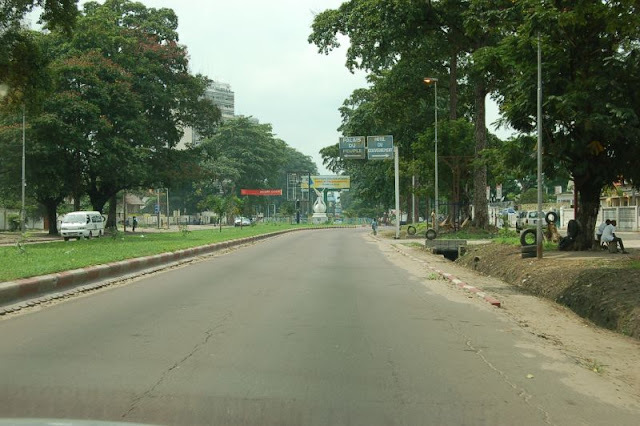 During the last three years I’ve lived here, this seven-kilometer artery through the center of Gombe Commune has provided mostly smooth and efficient movement of traffic (though the downtown section from the Gare Central to Ave. Huileries is often congested from mid-morning to midafternoon). 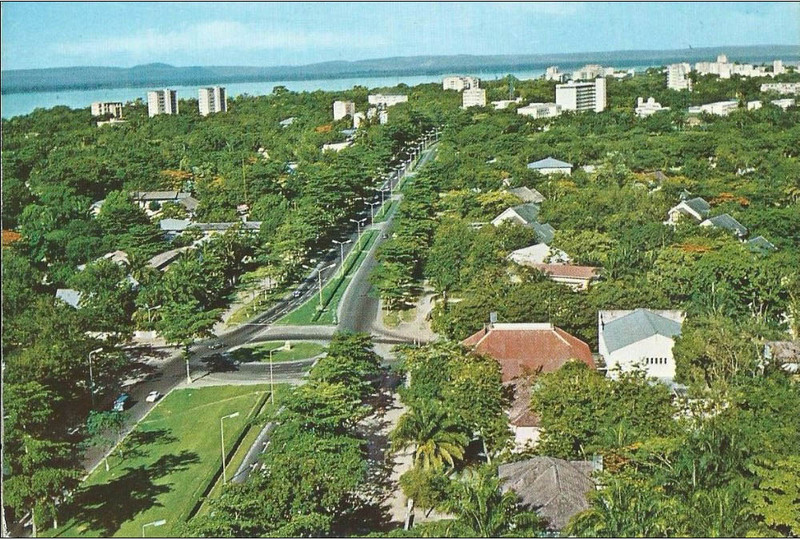 The stately Limba (Terminalia Superba) trees and the landscaped traffic islands are gone, but as a transportation solution for a growing city, it works. On my morning commute on April 1st I found traffic snarled at the intersection of Ave Liberation (ex-24 Novembre, aka Rond Point Mandela) and 30 Juin, where technicians from the Office de Voirie et Drainage (OVD) were digging up the pavement to take soil samples prior to construction of a major concrete overpass at that intersection. 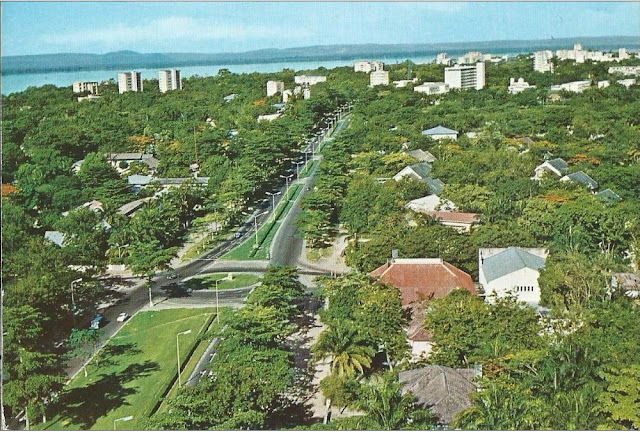 The rond point in 1954 with new Blvd under construction. Sabena towers upper right. 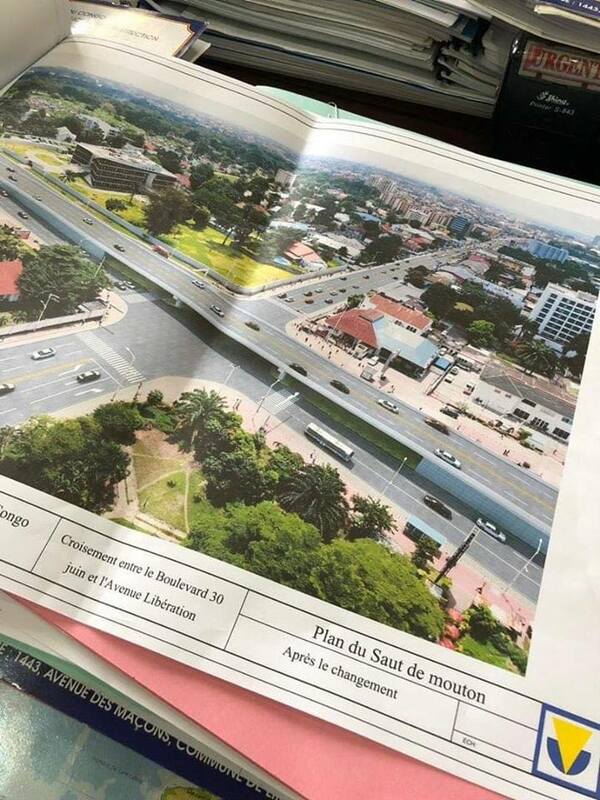 Today OVD announced several contracts with two Chinese companies and Office des Routes to build overpasses at notoriously congested intersections. The projects are to be undertaken in the framework of President Tshisekedi’s “100 Days” national infrastructure campaign. The OVD Plan for the overpass. Blvd. 30 Juin at Ave. Liberation looking east. Coincidentally, two days later, I found an article posted on Citylab describing how US cities are tearing down urban freeways in favor of surface boulevards (like 30 Juin serves today), which allow residents in isolated neighborhoods to travel from one to the other, reduce noise and air pollution and free up land for other development, including affordable housing. 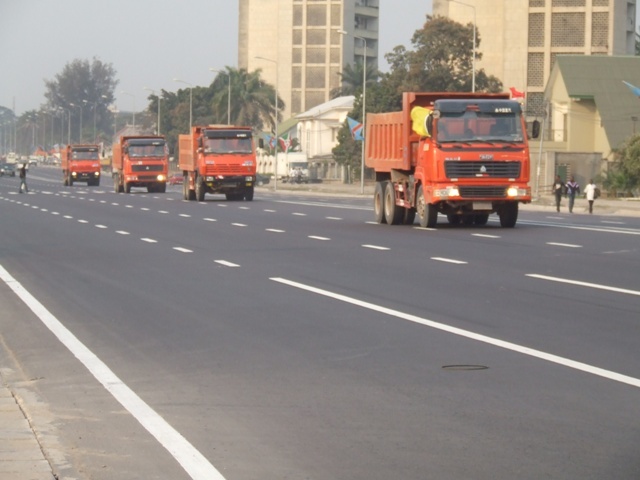 The planners at OVD seem to be taking Kinshasa back 50 years in terms of what was then considered state-of-the-art transportation planning. It is reported that this “traffic solution” will be applied to Ave. Liberation and Sgt. Moke, at Ave Sendwe and Blvd. 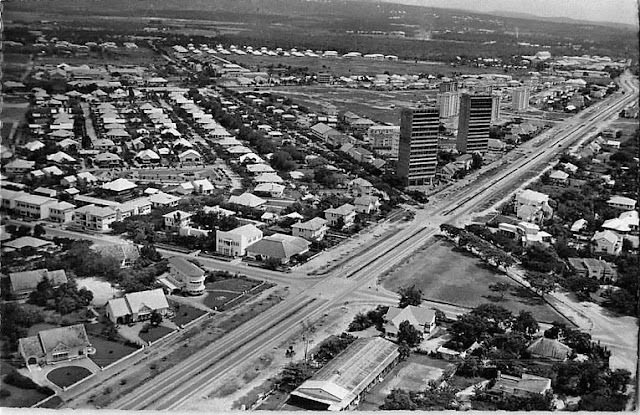 Lumumba, at Ave Kasavubu and Triomphal, Socimat Circle, at the junction of Boulevard du 30 Juin and Ave Mondjiba, and the snarl of Kintambo Magasins at the western end of Mondjiba. Oakland, CA. Plan for replacement of I-695 elevated freeway with a surface boulevard. The problem at 30 Juin and Liberation (the closest intersection on my commute) is not traffic volumes (though these are only to increase if no other east-west, cross-town arteries are developed) but rather a total disregard of the Code de la Route by many drivers, most outrageously those of “ketch” shared taxis and taxi-buses that provide most public transport in Kinshasa. 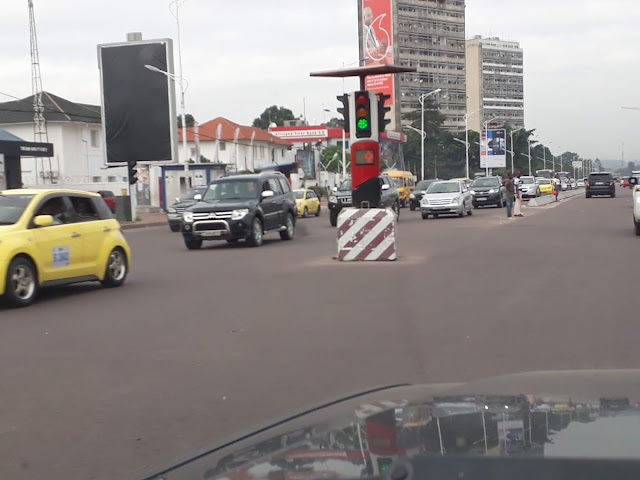 Traffic at this intersection is directed by one of the innovative traffic robots designed by a Congolese woman engineer (Aug. 17, 2016). If one follows the signal, traffic can move smoothly. But invariably, a selfish driver will ignore the signal and create gridlock with vehicles trying to follow the light. Meanwhile, the “Roulage” traffic police, are observed to be more interested in shaking down random motorists for petty bribes than enforcing the Code. 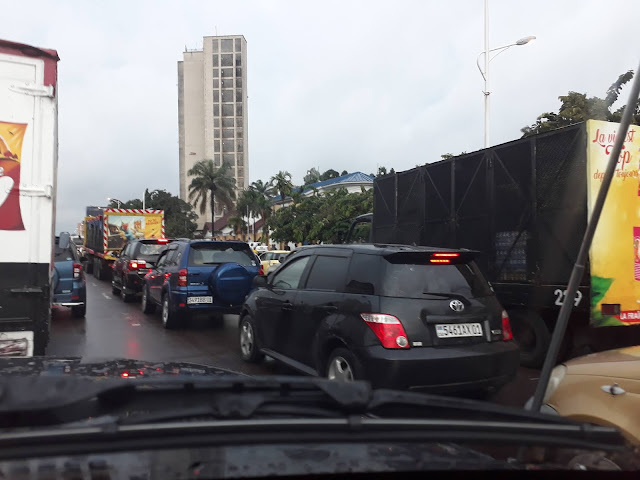 It appears that the approaches to the overpass will block vehicular and pedestrian traffic along at least one kilometer of 30 Juin, from the second “Sabena” building (Mar. 29, 2011) on the west to the Cimetière de la Gombe to the east. To be fair, there are no lively, interconnected neighborhoods threatened with exclusion by this proposed barrier, but commuters already have to straddle a 60-centimeter concrete divider to cross the Boulevard at Ave. Forces Armées as well as at Ave. des Jacarandas by the Belgian Embassy. The overpass will require them to hike 500 meters to Ave. Liberation to cross the Boulevard. The protected areas under the overpass risk becoming havens for the shegué street children who already beg at the intersection. Kinois are familiar with the vaunted technical solutions for this intersection. In 2009, when the Boulevard was being widened, the traffic circle named for Nelson Mandela, with its inspiring “Peace Dove” monument was razed. 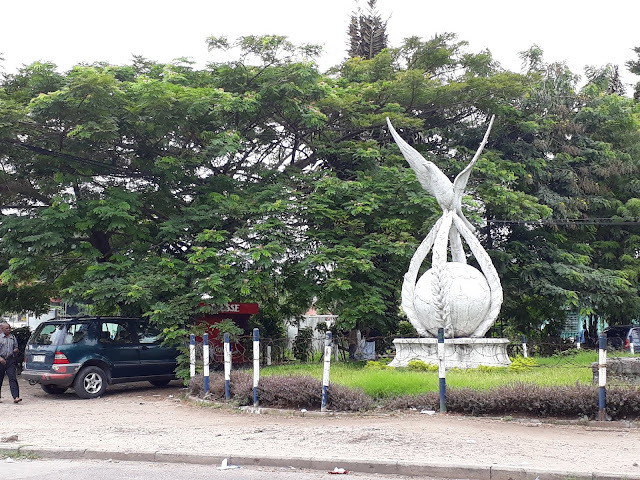 The monument, created in August 1991 to commemorate Mandela’s visit to Kinshasa, was relocated a block north to the corner of Ave Kisangani and Justice outside the Nigerian Ambassador’s residence. At the time, Vice Prime Minister Bongeli justified the move, “To make an omelet, you must break the eggs”, promising that trees would be replanted to meet modern standards and the monument repositioned where people could admire it. A decade later, trees have not been planted and the monument appears to have been dumped in the weeds at this intersection rather than placed there in permanent honor. Efficient traffic management at this intersection is possible without an overpass. The “Roulages” traffic police can properly enforce the Code de la Route, as was the case when the City enforced registration of the informal taxis in 2018 and painting them uniform yellow. 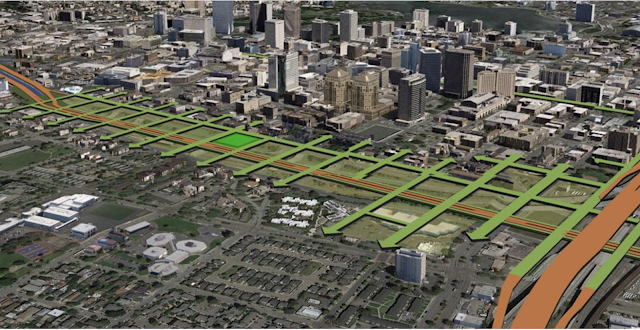 The proposed overpasses appear to be an expensive solution to a mis-diagnosed problem. There are several east-west corridors (Aves. OAU-Prince de Liege (Sgt. 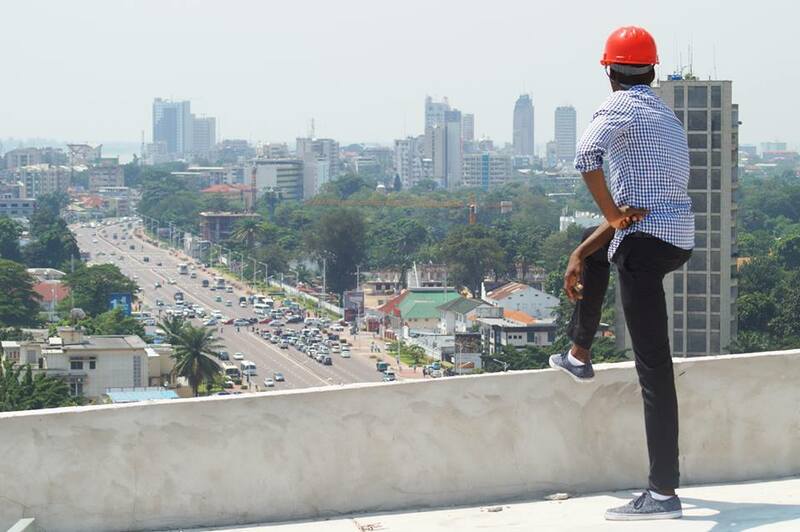 Moke)-Kabinda corridor is the closest parallel route) that could benefit from this kind of investment and reduce pressure on Blvd. 30 Juin. But engineers like to build. This task should be given to traffic planners. 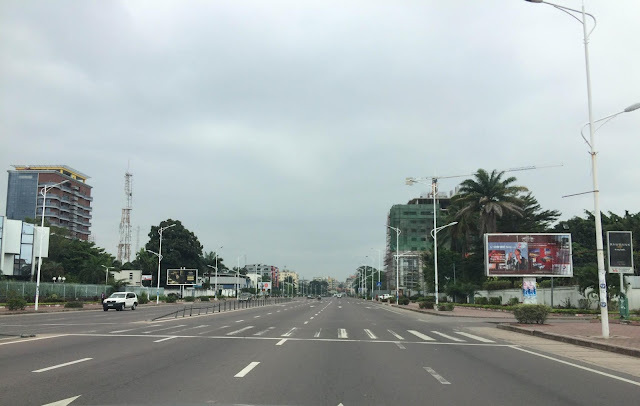 It is not the purpose of this blog to take a nostalgic view of Kinshasa as it once was, but rather to question whether all reasonable options have been considered to improve the city’s development.